I'm back with another card to share with you today and I finally got around to trying a technique that has been on my to do list. The technique is called Triple Time Stamping. The reason it is called this is because you are stamping on three layers at one time and you end up with a pretty cool card when you are done. I'm so glad that I finally took the time to try this technique! The Secret Garden set which is new in the Spring catalog I felt just begged to be used for this technique. I can see myself using this technique again. Here's the outside of my card. For me the difficult part was deciding what colors to use. 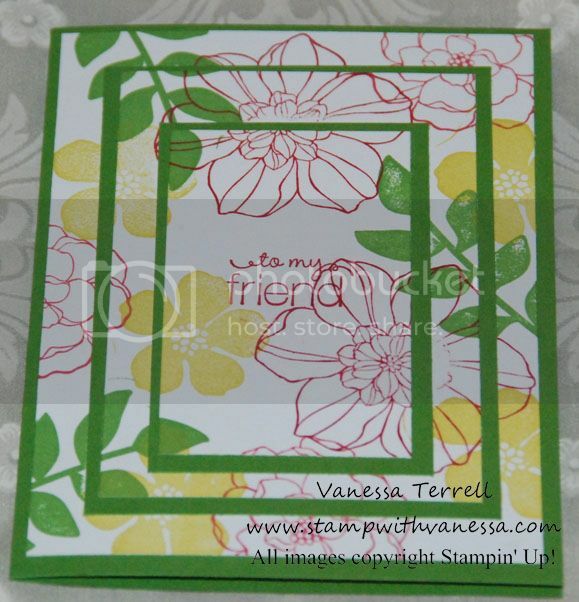 I like using the Brights color family from Stampin' Up! The colors I used are all from the new In Colors. Here's a peak at the inside of the card! 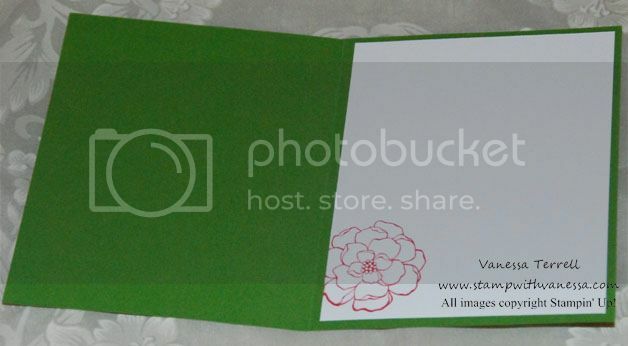 I stamped a flower image from the set but decided not to stamp a sentiment; instead I will write a personal message. I can check this off my growing list of things to try! If you would like to learn this technique I would be happy to do a workshop for you and your friends or even a one-on-one technique training. Thanks for stopping by! Click here to place a Stampin' Up! order. L-O-V-E your blog Vanessa. I will come back just to feel pretty:) And your project for today is crazy-cute.